Clear window clings are used all over the place. Usually, however, they are produced on wide format equipment with a vinyl product. Many of our customers told us they farmed out their cling work because they didn’t have the right equipment to do the work in-house. Fusion Digital Paper’s™ Crystal Clear Cling has changed all that. The Ivins Chamber of Commerce sample pictured to the left is a perfect example of melding the benefits of digital printing with a Fusion Digital Paper™ substrate to provide a durable, personalized solution for an end user. Fusion Crystal Clear Cling is one of our most popular products. It’s truly clear and allows you to quickly and cost effectively produce clear window clings in-house on your sheet fed production toner digital equipment. As you can see, this sample shows the great print fidelity and excellent toner adhesion you can achieve, and how using dark colors yields good “color pop.” Remember, all Fusion Digital Paper™ products are engineered for high heat fusing and designed for both safe runnability on your digital production toner equipment, and better performance in the field. Fusion Crystal Clear Cling’s polyester face stock will not distort, shrink, stretch, or melt under high fusing temperatures, and will not yellow, get brittle, crack, or tear like vinyl does. 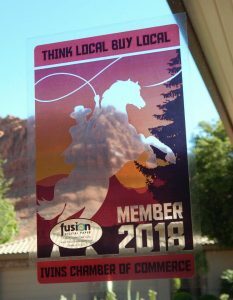 Fusion Crystal Clear Cling can handle wide temperature ranges so it can be used on glass for all types of applications, including the inside of car windows for decals and parking permits, or for alcohol beverage marketing when signs must be reverse printed and posted inside the establishment’s window. 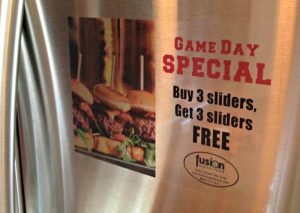 Fusion Crystal Clear Cling is even great for smooth stainless steel surfaces so you can place marketing or safety messages on refrigerators and appliances where magnets won’t work. One of the first things you will notice when you remove our Fusion Crystal Clear Cling from the release liner and apply it on glass is that it virtually jumps right onto the glass with great cling strength. You can apply it dry and use a felt squeegee to get the air bubbles out, or you can first apply water to the glass with a sponge or spray bottle, then apply the Fusion Crystal Clear Cling and follow up with a felt squeegee to remove the air bubbles. The dry application method is usually fine for smaller sized clings, but for larger clings I prefer to use the wet application method. In both cases, please note that Fusion Crystal Clear Cling will be clear when initially positioned, but will “wet out” and actually appear clearer after 48 hours. If you have a UV wide format or flatbed printer we also invite you to discover the optical clarity, excellent print fidelity, color popping brilliance and ease of installation of our Fusion Crystal Clear Polyester Cling for UV, available in 54″ and 60″ x 100 ft rolls. Fusion Crystal Clear Polyester Cling for UV is super easy to install and durable enough to survive in the field for years. At Fusion Digital Paper™ we’re focused on better. Better products, better productivity, and better solutions.